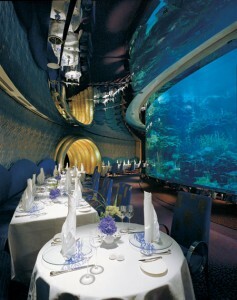 Welcome to Burj Al Arab, Dubai. Arrive in absolute awe, stay individually inspired. In its relatively short tenure on the Dubai coastline this legendary and symbolic hotel has attracted international attention and awe, ensuring its place as one of the most photographed structures in the world, and consistently voted the worlds most luxurious hotel. Designed to resemble a billowing sail, Burj Al Arab soars to a height of 321 metres, dominating the Dubai skyline. Illuminated at night by choreographed lighting representing water and fire – Burj Al Arab is simply individual, inspired, impressive. 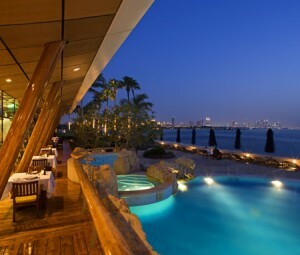 This all-suite luxury hotel in Dubai reflects the very finest that the world has to offer. With a discreet in-suite check-in, private reception desk on every floor and a brigade of highly trained butlers, you can be assured of the ultimate in personal service throughout your stay. Upgrade your experience at Burj Al Arab with your chauffeur driven Rolls Royce. Dubai International Airport is 25 kilometers away. Rolls-Royce or BMW limousine services are available at a charge. * * * Directions from the Airport to the Hotel – Follow the exit signs from the airport terminal. At the first roundabout, take the third exit – following the signs to Abu Shabi and Jebel Ali. Continue to follow signs to Abu Shabi/Jebel Ali, approaching the Sheikh Zayed Road motorway. Continue to follow signs to Abu Dhabi/Jebel Ali. Take the exit available on the 4th interchange where the Dubai Police College is located on the right hand side. Drive straight and turn right on the second roundabout. Keep going straight until the first roundabout. 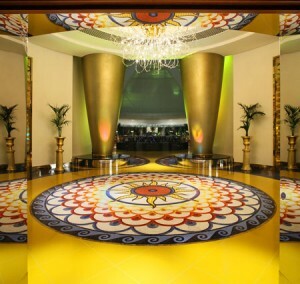 Keep to your left and take a U-turn and follow directions leading to the main gate of Burj Al Arab. Note BeneThere is a private reception desk on each floor. Banquets & Meetings Some rooms have views of the Arabian Sea. Business Center Each room has private fax, printer and copier. Disabled AccessHotel has special suites for disabled. Child Programs Activities can be arranged at the hotel or Wild Wadi park. Pool, IndoorOne mixed and one women only, with use of fitness centre. Beach Private beachfront. Ecological Tourism Desert safari. Golfing Choice of Montgomerie Golf Course or Emirates Golf Course. Sailing Hobie Catamaran Sailing. Recommended RoomsAll the suites are unique with design and views. The recommended Presidential Suite bathroom has Jacuzzi and a view of Arabian Sea. In addition to a dining and living area, each suite has an office area complete with laptop, Internet access, private fax, printer and copier; Hidden network of advanced technology – lighting, curtains and air-conditioning at the touch of a button; 42-inch plasma screen, video on demand, DVD and a wide variety of cable channels.